. : Farm Forest Line - Waterlogging and Salinity :. 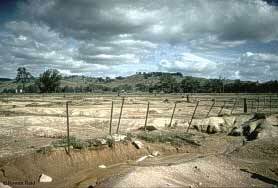 Saline and waterlogged soils, saline creeks and rising water tables collectively represent one of Australias biggest environmental catastrophes. Since effective salinity control will generally require a large investment and may take many years to assess, it is important to try and understand as much as possible about the cause(s) of salinity problems. Dryland and irrigation salinity result from a groundwater problem. Increasing waterlogging and salinity are just the symptoms resulting from a hydrological imbalance that may be occurring at a catchment scale or in a localised area. In Australian farming areas this imbalance is largely caused by the clearing of perennial trees and shrubs and their replacement with annual crops or pastures unable to utilise and absorb as much rainfall as trees. Water that is not used by the plants or stored in the soil surface may percolate below the root zone into the groundwater. The recharge under a pasture or crop may be 10 to 100 times that which occurred under the native forest that it replaced. Once a saline watertable nears the surface, water is evaporated which increases the salt concentration in the soil profile, with salt often left on the surface. The combined effect of waterlogging and increased soil salinity is devastating for most plants. Agricultural productivity declines and native vegetation can be destroyed. The result is not only reduced farm productivity but also damage to infrastructure and loss of native flora and fauna that depend on it. The problem is complicated by the effect of soil type, geology, the presence of barriers to water flow or even underground streams. Because salinity commonly affects many farmers and businesses in a particular catchment, government support may be available to investigate the actual processes causing the problem and opportunities for controlling the rise and flow of water within a catchment.